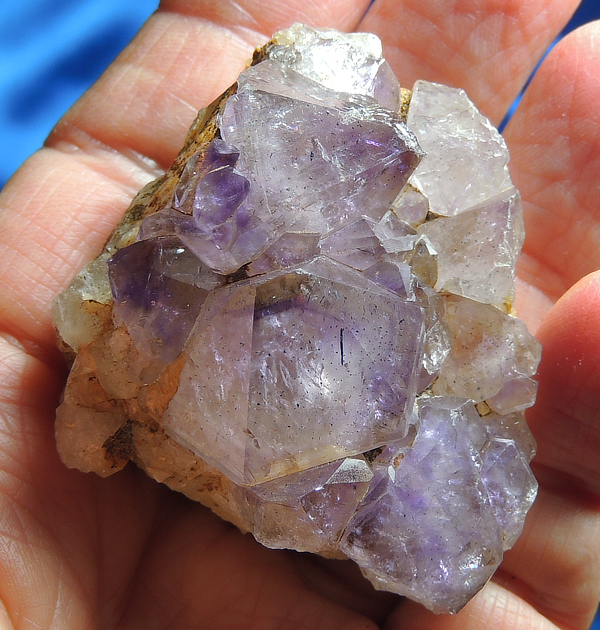 This amazing crystal cluster from Madagascar is a lovely light violet and is 2.4 oz, 0.9” by 0.7” by 0.6”. The amethyst points sit atop a thin layer of golden healer-stained, stabilizing Mother Earth matrix. There are marvelous glyphs on the faces with more golden healer in the crevices. Inside, there is a world awaiting your loupe … phantoms, rutile, lepidocrosite and tiny spheroids of hematite. She has an all-over ethereal and mystic look and you will not believe the beauty or energy she exudes, particularly for one so small! She is a perfect size for carefully tucking into a medicine pouch.